If you’re travelling with Turkish Airlines on an upcoming flight, here’s everything you need to know about your Turkish Airlines baggage allowance and fees. Cabin Baggage (hand baggage) is defined as any baggage of 8 kg and 55 x 40 x 23 cm. Each passenger is responsible for his/her own cabin baggage, which is carried into the passenger cabin free of charge. Note: Suit covers (114 x 60 x 11 cm) shall be considered as cabin baggage. Duty-free products shall be excluded from the implementation of cabin baggage carriage regulations. In the event that the dimensions and/or weights of personal items exceed the cabin baggage limits, they will be considered as checked in baggage. Note: Allowance may vary according to reservation class and departure runway. *Departing from and arriving at Turkish airports. *Baggage information for America, South America, Canada, Argentina, Colombia, Panama, Cuba, Venezuela, Nigeria, Ghana, Senegal, Mauritania, Cote D Ivoire, Cameroon, Burkina Faso, Niger, Gabon, Chad, Congo Dem. Rep., Benin Peoples Republic, Mali, Guinea, Sudan, Angola, Mauritius, Madagascar, Seychelles, Japan Flights where baggage is processed by piece. In Transit Flights are applied at 10 TL per KG. At airports where baggage is processed by kg, excess baggage charges are calculated as follows: The charge specified for the Zone of the point of departure – Turkey plus the charge specified for the Zone of point or arrival – Turkey (in LT). 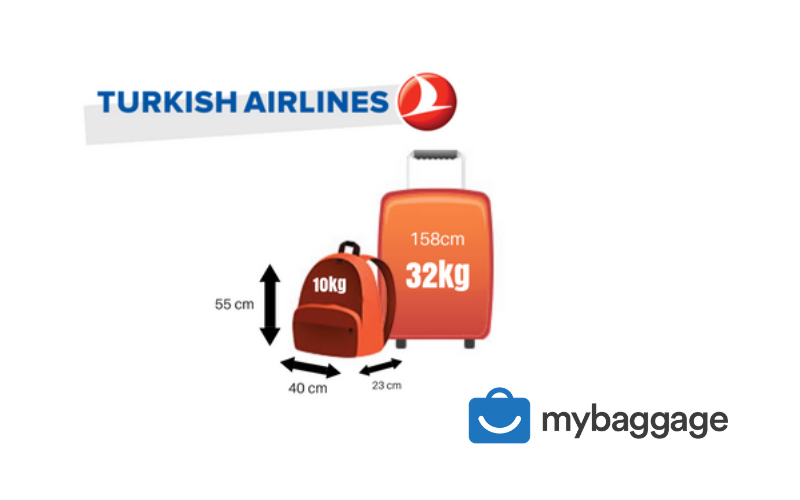 To find out what zone your airport qualifies under, please visit: Turkish Airlines Excess Baggage Information. In flights to or from any point in America, S. America, Canada, Argentina, Colombia, Panama, Cuba, Venezuela, Nigeria, Ghana, Senegal, Mauritania, Cote D Ivoire, Cameroon, Burkina Faso, Niger, Gabon, Chad, Congo Dem. Rep. Mauritius, Sudan, Madagascar, Seychelles, Japan excess baggage charges are calculated for each piece of baggage. To find out the detailed calculation for excess baggage, please visit: Turkish Airlines Excess Baggage Information. You can carry the sports equipment listed below or any similar items with you on Turkish Airlines flights. They will carry your first set of golf or skiing equipment free of charge. Turkish Airlines is an undeniably affordable travel option if you are travelling with a small amount of luggage off season. However, if you exceed the weight allowance, book baggage at the airport or travel during peak periods, you may face considerable charges.